The first few months after giving birth, called the postpartum period or "4th trimester," is a time of great transition for new parents. Our doula clients tell us that it sometimes feels disorienting as their routine and their baby are changing day by day. It's common and completely understandable that this time might be be quite challenging. A body that was been pregnant is adjusting to not being pregnant (and is recovering from birth). A new person is here with needs, preferences, and no language to share them. Gathering support means navigating relationships with family and friends who sometimes have their own ideas about what they can contribute to help. Most of all - this experience is isolating for so many. Parents often don't realize that the emotional roller coaster they're experiencing is NORMAL. As a culture, we don't have much involvement with this special but vulnerable period of time... except for horror stories, that is. We've all heard these stories from friends or family members who've walked this road before - "Sleep before the baby comes - afterwards, you won't sleep again for months!" "I didn't take a shower for three weeks!" "He cried non-stop for weeks!" Well... while some of those things are par for the course (yes, sleep is different with a baby around, it can take some juggling to make personal time for a shower happen, and babies do cry), there are normally other things that pop up in the postpartum period that are a little more unexpected. 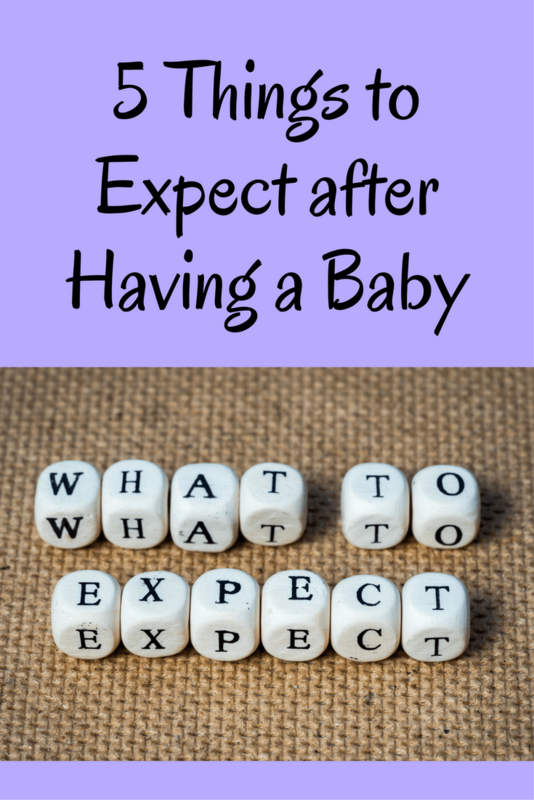 To help soften some of the "No one ever told me..." experience, we've put together this list of 5 things you can expect to experience after your baby arrives that you might not have thought of - as well as, of course, some tips and encouragement to work through these challenges. Parents are often taken by surprise by just how much there is to learn in the first few weeks of having a baby. "What should we do if she keeps falling asleep during feedings?" "Does his umbilical cord look normal?" "Are these crib bumpers safe?" "How can I help her learn to take a bottle?" It's tooootally normal to have what feels like a hundred questions a day. There is SO MUCH to get used to in your "new normal." Caring for a baby full-time is likely very different than you pre-baby everyday life. And if you've never spent much time around babies, it's only natural that there are things that might take some getting used to! You're doing all this learning on a less-than-ideal amount of sleep. Absorbing new knowledge as an adult is tough enough as it is (compared with our sponge-like brains as kids), and a lack of sleep doesn't help! Be patient with yourself as you move through these early days. You're doing so many things for the first time! It's ok if it takes a while to learn what you need to know and acclimate to life with this new little person. And of course if you need some extra support as you learn about your baby, that's what postpartum doulas are here for! Here’s a list of reasons why people hire postpartum doulas in case you’re interested to learn more. Aah, relationships. Just what you wanted to worry about after having a baby, right? Right. It can be tricky to navigate the shifts in relationships after birth. Your partner, your parents, your partner's parents, siblings, your older children, your doctor or midwife, your doula, ... not to mention the relationship that's changed from the outside in - your baby! There are so many people at play, and often things from the past can surface during this raw, vulnerable time. It can be hard to balance requests from friends and family to visit with tending to your own physical and emotional needs to working through the 7 recommendations your pediatrician just gave you this morning. Many new parents love the idea of a "babymoon," hunkering down in their nest for a while after baby arrives. For some, this is doable. For others, it's just not. Whether you want some privacy from friends and family or are looking forward to their presence in your home postpartum, managing relationships can be tricky. The postpartum time can be an opportunity to practice asking for what you need. Do you need extra help from friends and family? Ask for it. Do you need extra space instead? Try to let them know gently. Do you need to be able to vent without someone trying to "fix" whatever it is you're working through? Have a conversation about that. Even negotiating with your partner who will do the tasks that keep your household running (paying bills, clearing the table, neatening up, cleaning the bathroom, etc.) can be a challenge. Be compassionate with yourself and your partner as you work through these questions together. We usually recommend the Love Languages quiz to our clients. If you haven't done it before, give it a whirl! Knowing the ways you and your partner prefer to show and receive love can come in handy after birth when you both need some emotional refueling. If you've recently given birth, chances are your body feels a little different. A little more tender here, a bit sore there... and something like hemorrhoids to top it off? Not to mention the changes that nursing can bring, if that's how you're feeding your little one. Pregnancy gives you weeks and weeks to acclimate to physical changes but birth happens so quickly. It's ok if your body isn't feeling quite itself just yet. There are lists all over the internet listing what physical changes you can expect postpartum. It's one thing to read those lists, and another thing entirely to experience them firsthand. If you and your body need some TLC during this time, there are lots of things that can help. Acupuncture, massage, and chiropractic care are some great places to start. Placenta encapsulation can also help - read our interview with a local placenta specialist to learn more. Of course, eating well is important too! If you have loved ones nearby who want to help, ask them for help with meals. You might even ask a friend to set up a Meal Train for you. Many parents are surprised by the amount of time it takes to care for a new baby. Did you know feeding a baby can sometimes take 45 minutes to an hour? And that newborns need to eat every 2-3 hours? When you mix in diaper changes, soothing, tummy time, dressing, bathing, and naps, AND basic hygiene and rest for yourself, there isn't a lot of time leftover to do your normal stuff. Your house may not be as clean or organized as usual. You and your partner may not have time to prepare meals like you usually would. Small things like putting dishes away or doing laundry (although if you're anything like me, laundry never felt small to begin with) may take longer than usual, or sort of be impossible to keep up with for a while. Forget long hikes, lazy afternoons reading a book, and going out to a movie on a whim (at least for a while). There are a lot of changes happening. It can be tough to say goodbye to your old lifestyle, your old self. As you get acquainted with a new part of yourself, the parent of this new baby, there may be some grief that comes with letting go of who you were before. It's normal. If you haven't considered babywearing - or if the options are confusing and overwhelming (we get it) - give it a shot. If there are supportive people in your life who are willing to help you during this time, let them! Anything from cooking to cleaning to giving your pets some love and attention... all these little things add up so quickly when you're busy with a baby. Take a peek at our Meal Train 101 blog post for a quick tutorial on coordinating the gift of food after your baby is born! But remember - to people in the outside world who aren't caring for a newborn, those things are still small. If there is anything not taken care of by friends or family and you have the means, consider hiring some outside help. It can be hard to accept help, especially for many of us who love to feel in control. But during the postpartum weeks and even months, this kind of help can be exactly what's needed. There is so much going on postpartum. Things we've already talked about here (huge physical changes, relationship changes, learning to care for your little one, sleep that is probably broken up more than you'd like...), and more besides. All of this is bound to affect your mood at one point or another. You're human, after all. Most new parents deal with some amount of "baby blues" or mood swings in the first few weeks. The work you're doing is hard! It's understandable that under stress and with as little support as is common these days, that humans doing the work of early parenting would experience some difficulties. That totals 323 points, indicating an increase in the possibility of a stress-induced health breakdown to 80% within the next two years, according to this study. Scary much? The truth is, the postpartum period is intense. Life with a new baby can be very challenging, and it's only fair that those challenges would affect mental health (and therefore physical well-being). If things are getting tough to deal with and you need some extra support, reach out. We have some wonderful postpartum therapists in our area, as well as new parent support groups. And of course, coffee with a friend can work wonders. Parenting can be HARD. There are no magic fixes for some of the most challenging parts of assuming full responsibility for another being, but don't underestimate the power of love and support. We hope you found this list helpful! If you've been there, done that - what are some challenges you encountered and overcame? What helped you get through it?